Not actually for the win… there’s not much to be gained. However I find it fascinating that people are actually building dedicated chips (ASICs) to mine crypto currencies (BitCoin etc.). So after mining litecoin on my AMD Radeon HD7950 GPU for a bit two years ago, I decided to order some mining hardware. 2 Gridseed scrypt (litecoin) miners and 1 Antminer U3 sha256 (bitcoin) miner. 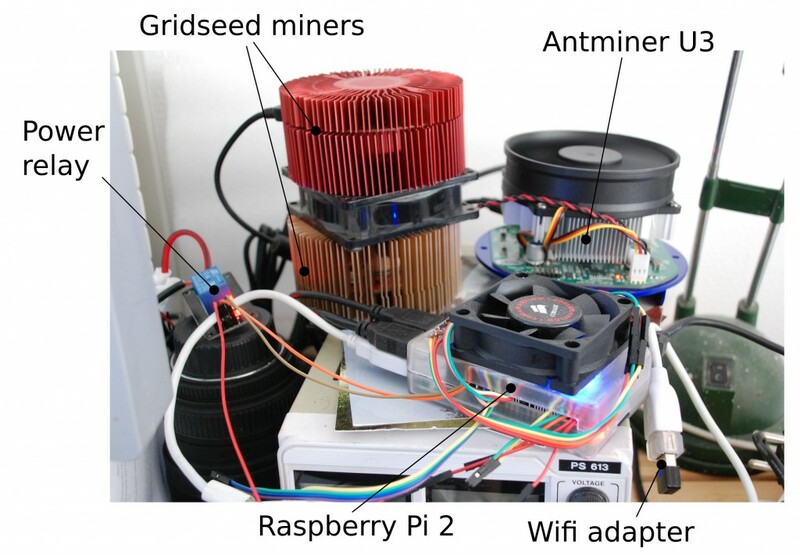 The miners are connected to a Raspberry Pi (mini linux computer) through USB and the Raspberry Pi in turn is connected to the internet using a wifi adapter. The Pi has two instances of the cgminer software running. One for the Gridseed miners and one for the Antminer. The Antminer occasionally fails and requires a power cycle in order to get going again, so I wrote a small script that runs on the Pi to monitor the miners and power cycle them using a 10A relay in case they fail. The Gridseed miners produce around 800k scrypt hashes per second and the Antminer around 60G sha256 hashes per second. Fairly impressive when you think my GPU (graphics card), which is pretty much top of the line even today, produced around 450kH/s scrypt or 500MH/s sha256 hashes at several times the power draw. It made me realize how powerful dedicated hardware can be compared to general purpose computing hardware. At a power draw of about 80W (I haven’t measured it yet) on the socket, this setup approximately returns the cost of the electricity used. However it should be noted that mining is not just greedy digging for gold, but it also secures the crypto coin networks, which might turn out to be a useful thing in itself. After all, a distributed way of transacting value may be the best way in a world where banks are basically “amoral“. This entry was posted in Electronics and tagged antminer, bitcoin, crypto currency, gridseed, litcoin, mining, peercoin. Bookmark the permalink.